Thread: Trump: "Nancy Pelosi loves this country"
He is also highly confused if he thinks Chavez was good for liberty. Neither Chavez was much good for liberty. So, apparently we agree on something. Trump wants Pelosi as speaker because she will be a disaster for the left. Could this also be the reason he congratulated Obama at the end of his first term? He doesn't come across as an opportunist who changes his tune with the wind. Is Cortez trying to kick beloved Pelosi out? Nancy Pelosi is facing an unexpected flare-up on climate change that is complicating relationships among House Democrats ahead of crucial leadership elections. WASHINGTON — The message came in a distant January, at the dawn of a power transfer in Washington — dictated, like so much would be in due time, by something Donald J. Trump saw in the news. Mr. Trump had a small hand in her elevation. He had made a $20,000 donation to the Democratic Congressional Campaign Committee. House Minority leader Nancy Pelosi, who lead a delegation of Democrats to Israel and Jordan in late March. Jonathan Ernst/ Reuters Nancy Pelosi, the Democrat who likely will be Speaker of the U.S. House of Representatives, listed pro-Israel lawmakers she plans to name to key committee positions and said her party remained fundamentally pro-Israel. “We have people very well paced to share our values,” Pelosi, D-Calif., said, addressing the conclusion Sunday of the annual Israeli-American Council conference, after listing planned assignments. Pelosi said she would name Rep. Nita Lowey, D-N.Y., to chair the Appropriations Committee; Eliot Engel, D-N.Y., to chair the Foreign Affairs Committee; Ted Deutch, D-Fla., to chair the Middle East subcommittee; Adam Schiff, D-Calif., to chair the Intelligence Committee; Alcee Hastings, D-Fla., to chair the human rights-monitoring Helsinki Committee; Debbie Wasserman Schultz, D-Fla., to a key Appropriations Committee position; and Lois Frankel, D-Fla., to a key Foreign Affairs Committee position. All have longstanding pro-Israel records and all but Hastings are Jewish. Could MAGA-Pelosi bipartisan team produce some great universal healthcare plan with all the goods and no bads? 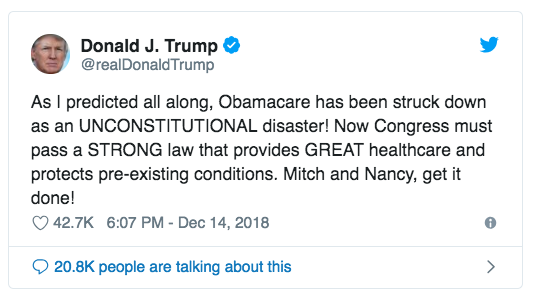 Pelosi may have been onto something when she said "Let's hear it for pre-existing conditions". Nice quote. MAGA is not perfect but he's no where near as socialist as HRC and has much better deal making skills. Not nearly as good as Barack. To be fair, Schumer also loves this country. As does MAGA's NSA Bolton. I think Pelosi and Schumer have endorsed an idea even Rand can agree with. Vote and pass individual Bills. wut, no omnibus bills, where 'save the children' bills include funding Sandinista Rebels ? Pelosi said she intends to begin passing individual bills to reopen agencies in the coming days. What's the source for this claim? Have Pelosi and Schumer really endorsed this? Or are you just inferring that from rhetoric they've used to engender sympathy for their position in the shutdown? Easy enough to google around but here's a Time article and a yt vid to get ya started. Is that all you were talking about? What's your source for whatever it was that you were talking about? Preferably something that's not a video if possible. Are you writing a thesis and need something for the bibliography? It just stood out to me as odd, so I just wanted to see if there was anything to the claim. Many, many, people have attended Catholic schools. And I'm not sure what percentage of those schools are Jesuit, but it's a high percentage. The Jesuits tend to be more school-focused than the other priestly orders. Whether at the K-12 level or the college level, there's nothing especially remarkable about the classes taught at these schools. In K-12 they include all the usual classes along with some very basic classes that teach about the Bible and Roman Catholic theology. In college, the array of specializations and the depth people can go in them is of course larger, but again, no different than other colleges, apart from some of what would be offered in the Theology departments, and there's nothing secret about the what is taught in any classes of course. Whatever secret conspiracies Jesuits may be involved in behind closed doors, they don't come out in the classes they offer the public. The Jesuits are a Roman Catholic priestly order. To be a Jesuit, one must be a Roman Catholic priest. To my knowledge, Trump has appointed zero Roman Catholic priests to any high office. Gorsuch is a Protestant who attended a Jesuit school as a child. Kavanaugh is a Catholic, but not a Jesuit. Like pretty much all active Catholics, he has a history of supporting in various ways various Catholic schools and other organizations, which would naturally include Jesuit ones. It's really hard to leap from someone attending an organization's school as a child, or sending their children to that organization's school, to that person being involved in a conspiracy with members of that organization, particularly if the organization in question is a Roman Catholic priestly order, and the person in question is not even a Roman Catholic at all. Jesuits are a papal military order, not a religious practice. No, a Jesuit does not have to be a priest. No, not all Catholic schools are Jesuit schools, per se, but some are very openly Jesuit, including the schools Trump attended and the schools his kids do. OTOH, some schools aren't even Catholic but do have Jesuit fraternities, such as Skull and Bones. I mean, believe whatever you want and choose to not research into it if you don't want to but I've seen loads of direct and anecdotal evidence that he's a member of the Jesuit order. I've seen loads of direct and anecdotal evidence that he's a member of the Jesuit order. If you really have seen evidence that he belongs to the Jesuit order (which is an order of Roman Catholic priests, unless you're talking about some other group that's also called by the name "Jesuit," in which case none of the connections with the Roman Catholic priestly order that have been mentioned are of any relevance), then why haven't you presented it? When I first asked you for your source, that would have been a good time to do that, rather than linking to a news article that said the exact opposite. Seems you have some skin in this game. Doth protest a little much. Anyway, I've already given you some 100% accurate evidence several times to get you started, you're free to research for yourself and draw whatever conclusions you wish. It's not my job to hold your hand. And again, no, Jesuits are not a priestly order, it is a military order, made up of crypto-Jew Catholic "converts". Hillary Clinton also loves this country. Not so sure about Julian Assange. "Dumb as a rock" Nancy Pelosi calls Africa a "country"